Most of us have either planned or attended a dinosaur party at some point in our life – it’s such a popular theme! 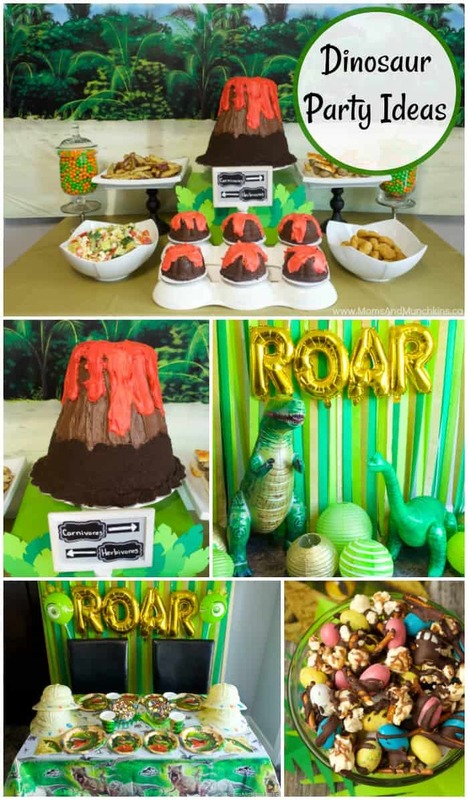 Last week we shared some fun dinosaur snack ideas and a free maze game and now today we’re sharing a collection of dinosaur party ideas from talented party planners and party planning mommas. Be sure to visit our Dinosaur page for even more fun ideas! Let’s start with this fun Dinosaur Birthday that I planned with Birthday In A Box. The photo booth backdrop was my favorite part! Or maybe it’s the Rice Krispie Volcano Cake…I can’t decide! This Dinosaur Birthday featured on Catch My Party is filled with so many creative ideas that I had a tough time picking just one photo to feature! 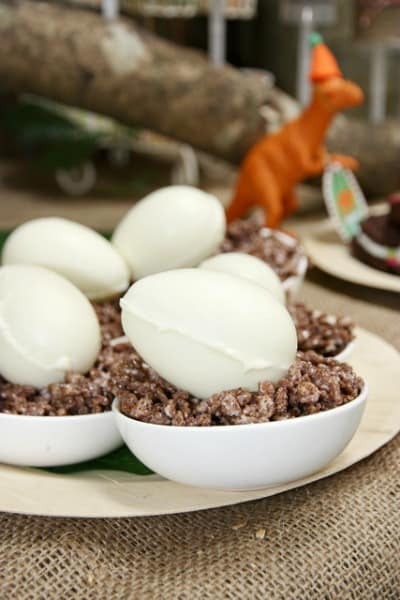 I love these dinosaur eggs on a crackle nest for the kids to snack on. The Puffasaurous treats are also incredibly clever! 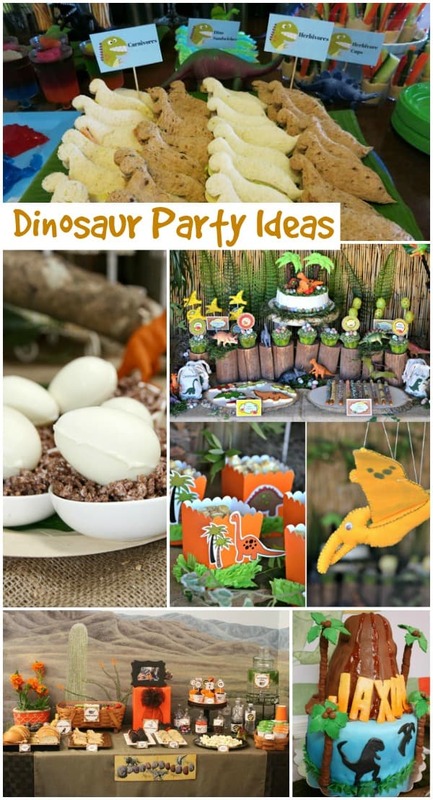 Learning With Play At Home has so many great ideas for dinosaur party food! 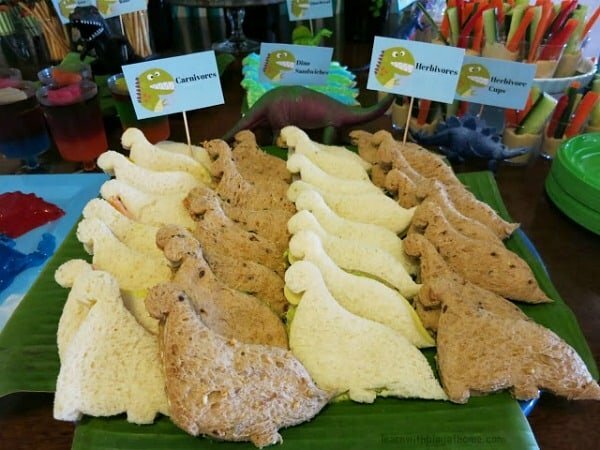 These herbivore and carnivore sandwiches in dinosaur shapes are sure to be gobbled up quickly. You have to check out the cake with chocolate rocks…I really want a piece of that cake right now! 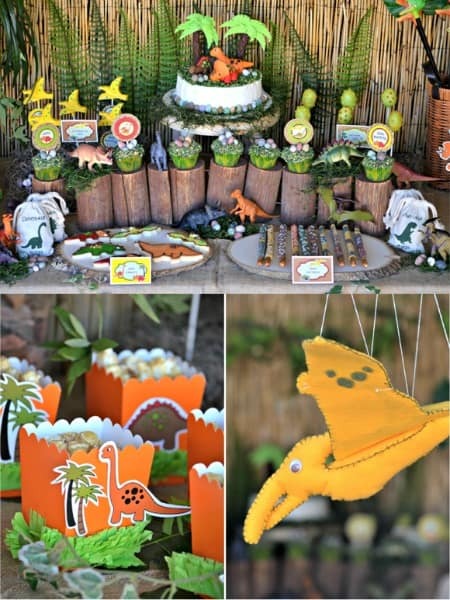 Crissy’s Crafts, Bird’s Party and other talented vendors teamed up to create this incredible Dino Hunter birthday party. 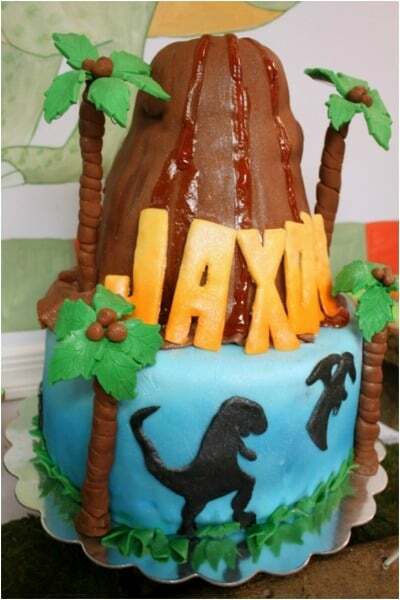 The level of detail is amazing and there are so many special touches here to make your dinosaur party fabulous! You have to check out the detail on the dino pretzels. They are amazing! This Dinosaur Birthday by KLM Events and featured on Spaceships and Laser Beams is so creative! My favorite piece of this party has to be the cake. It is incredible! 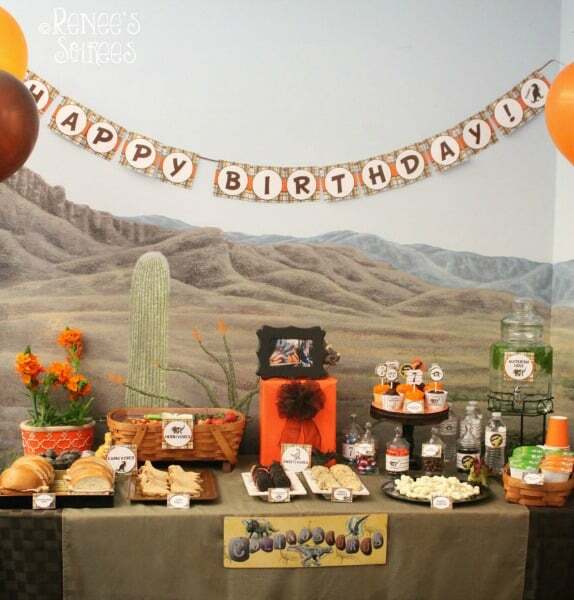 This dinosaur party table by Renee’s Soirees is filled with creative snack ideas like dino droppings, dino bones, dino eggs and more. Don’t forget to visit our Dinosaur page for even more fun ideas! Here at Moms & Munchkins, we love a good party! We’re always adding new party ideas for all ages. Stay updated on the latest by following us on Facebook, Twitter, Pinterest, and Instagram. how do you make the dino eggs? Hi Laura! I’m not the person who made the eggs but I’d check your local craft or baking store for an egg-shaped chocolate mold. That’s what it looks like she used to make these eggs. Good luck! Hi there! What is the crumble on top of the cupcakes? And how did you do the different sized speckled eggs?